Enhancement of SNA promotes cardiovascular disease. (A) Under normal conditions, hypothalamic modulators, including aldosterone (Aldo), angiotensin ll (All), endothelin 1 (ET1), arginine vasopressin (AVP), NO, atrial natriuretic peptide (ANP), and cytokines, influence SNA. In healthy individuals, SNA is promoted by excitatory neural input (red) in response to peripheral stress. 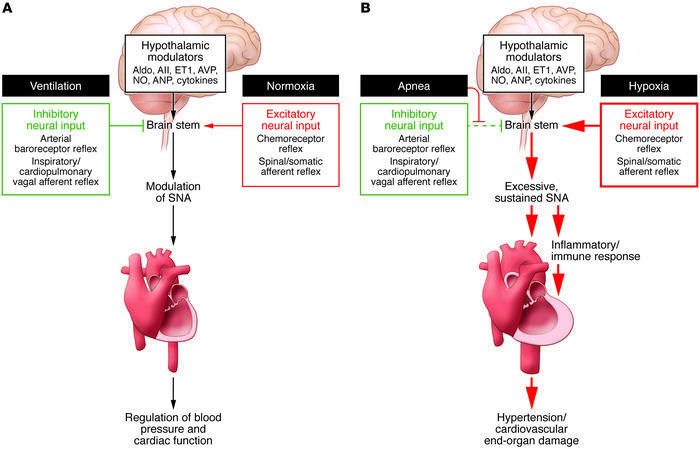 Simultaneously, peripheral responses (green), such as the arterial baroreceptor reflex and the cardiopulmonary and other vagal afferent reflexes, buffer the increase in SNA and maintain homeostasis. (B) Patients with OSA exhibit sustained excessive SNA, due to a pathological increase of excitatory neural input (red) and prevention and/or decrease of the protective inhibitory signals (green). Sustained SNA promotes proinflammatory immune responses and, ultimately, cardiovascular disease–associated end-organ damage.